Everything but the Kitchen sink can move down river with the spring floods. The Fish Ladder is designed to deal with most things but regular maintenance is required. 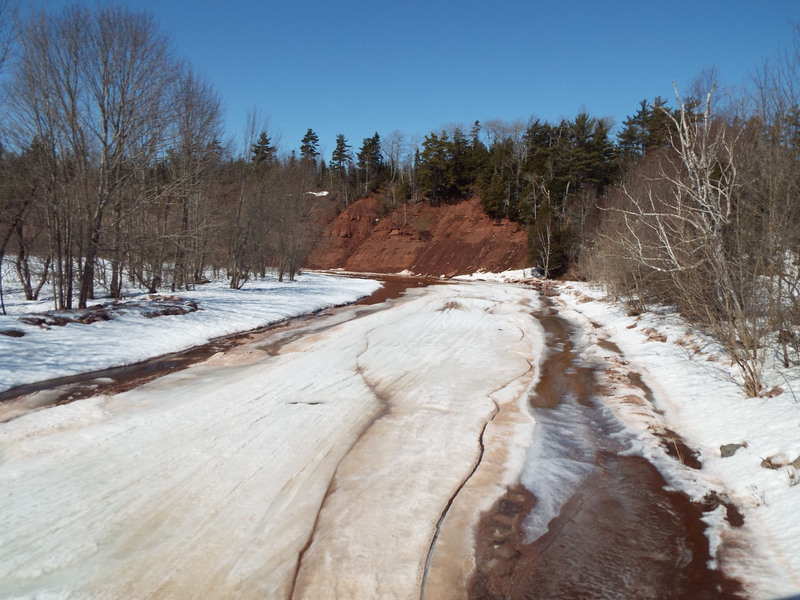 Fisheries and Oceans Canada and The North Colchester River Restoration Association have entered into a partnership to assure that debris will be removed and regular maintenance work days will have a combined crew from both groups. Yesterday was our First Joint Effort. 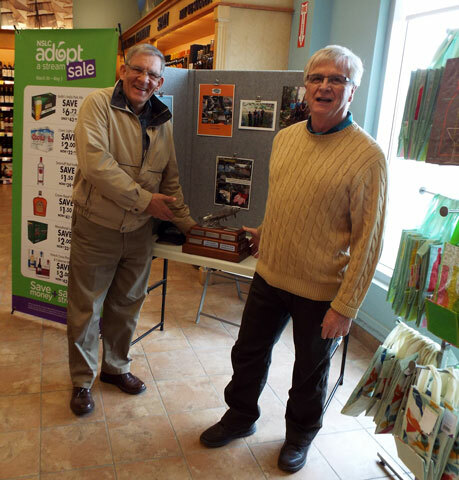 Mike Gregory the County Councillor for our District of Colchester County got his first look at our recent Provincial Award for Top Affiliate of The Nova Scotia Salmon Association. 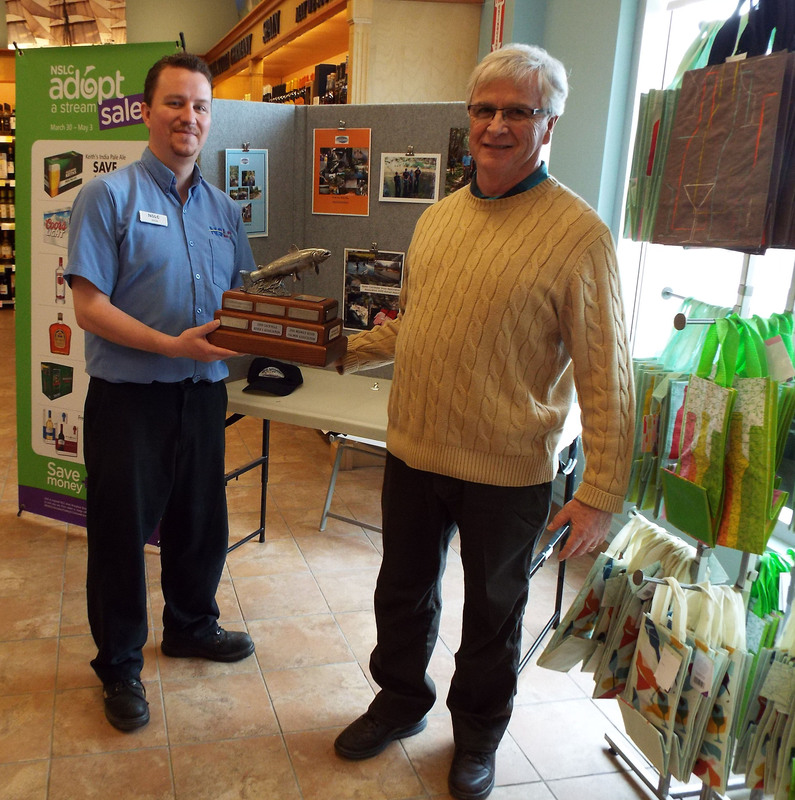 This award was in recognition of our 14 years of Habitat Restoration work on The French and The Waugh’s Rivers. 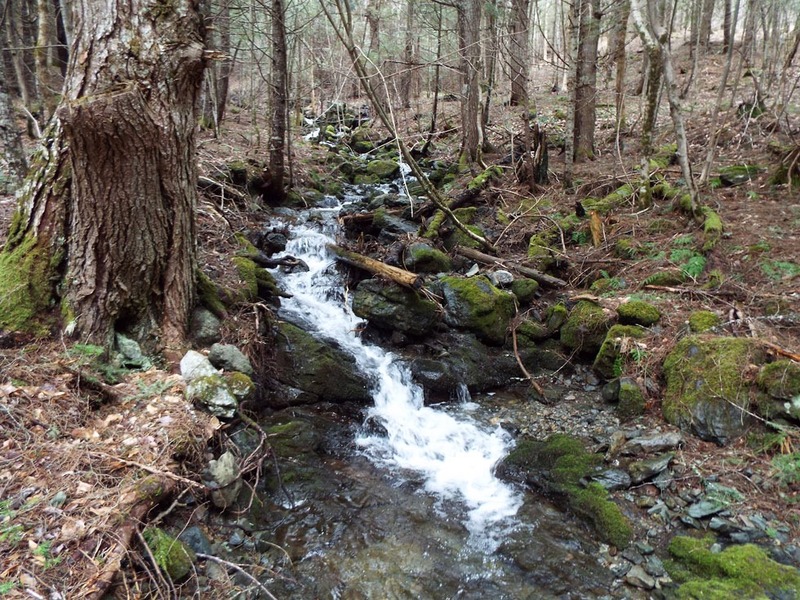 As Partners with Adopt a Stream the Nova Scotia Liquor Corporation raises considerable money to support River Restoration projects throughout the Province. 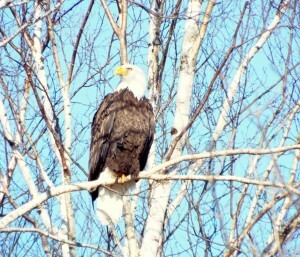 On duty today at NSLA Tatamagouche was Jason. He and Perry Swan our former Chairman set up the exhibit . 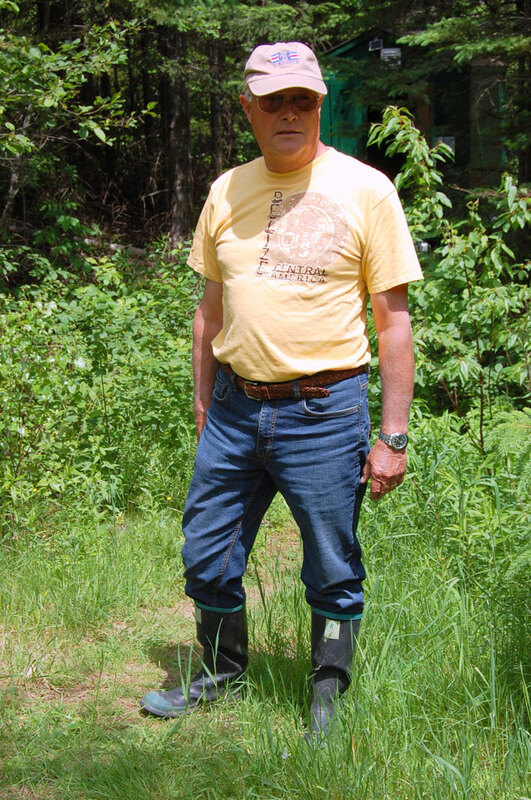 The new Chairman of The North Colchester River Restoration Association is Doug Bastow. Doug is a retired Air Canada Pilot with almost as many nautical miles at the helm of his sailboat. The season might be open but the fish are to find on the French River today. The good news is that the Waugh’s River is flowing high but clear of ice. 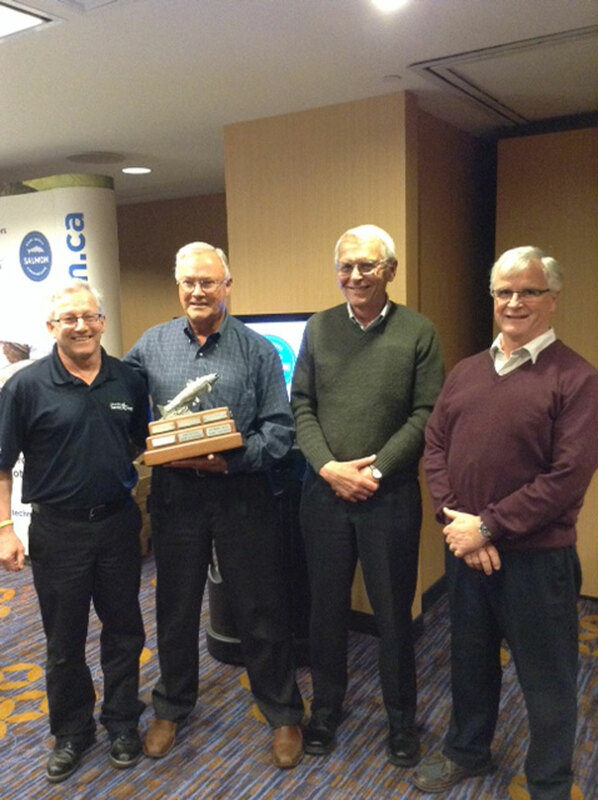 On Saturday in Halifax our Association “NCRRA” was awarded The Affiliate of The Year Award for the year 2014 by the Nova Scotia Salmon Association . 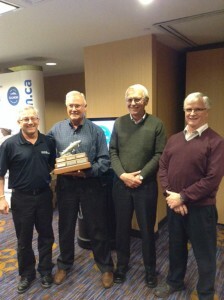 In the photo above are Rene Aucoin, President of the Nova Scotia Salmon Association, Doug Bastow current NCRRA Chairman and former NCRRA Chairmen, Allan Bonnyman and Perry Swan. Our Association NCRRA and several others from around the Province were invited to provide advice to a Special Ministerial Appointed Committee to look into the sad state of affairs of Atlantic Canadian Salmon in our rivers. Good morning Mister Chairman and Committee Members and thank you for the invitation to speak to you this morning. Everyone in this room is aware that there is a problem with Atlantic salmon in Atlantic waters. Hopefully our collective input today will improve the present state of affairs. 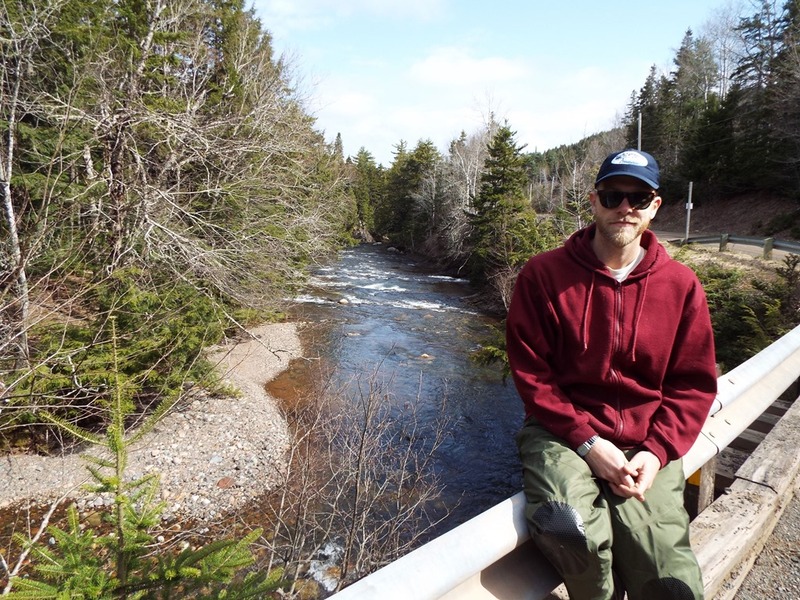 For 14 years I have been a member of a small but active Salmon Habitat Restoration group in Tatamagouche, Colchester County. From extremely low salmon returns we now have a good number of returns to The French and The Waugh’s Rivers. We have been able to improve this annual return rate significantly but will it last. My remarks today are not simply to be critical of others but to hopefully throw some light on how we can improve our joint efforts towards a common goal. 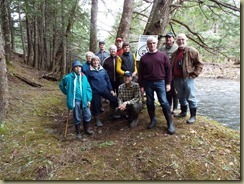 Salmon Conservation is an interesting and complex topic. Because it is our group’s main area of involvement I am confused that the Federal Government has just closed the Wallace office following the closures of The DFO Habitat Office in Antigonish. They have also cut all the area habitat staff positions. We believe that our program has been successful because we work in partnership with various agencies and government departments. Our objectives mirror their objectives and these recent federal office closures will make all of our work extremely difficult. 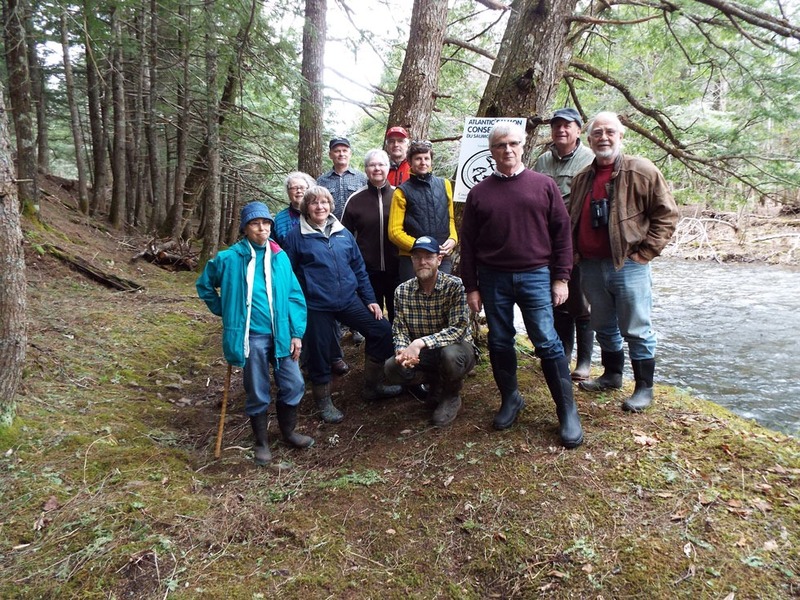 We suggest that additional federal funding be given to the Nova Scotia Salmon Association and other provincial associations and foundations so that they can have additional technical and financial impact on our local conservation programs. 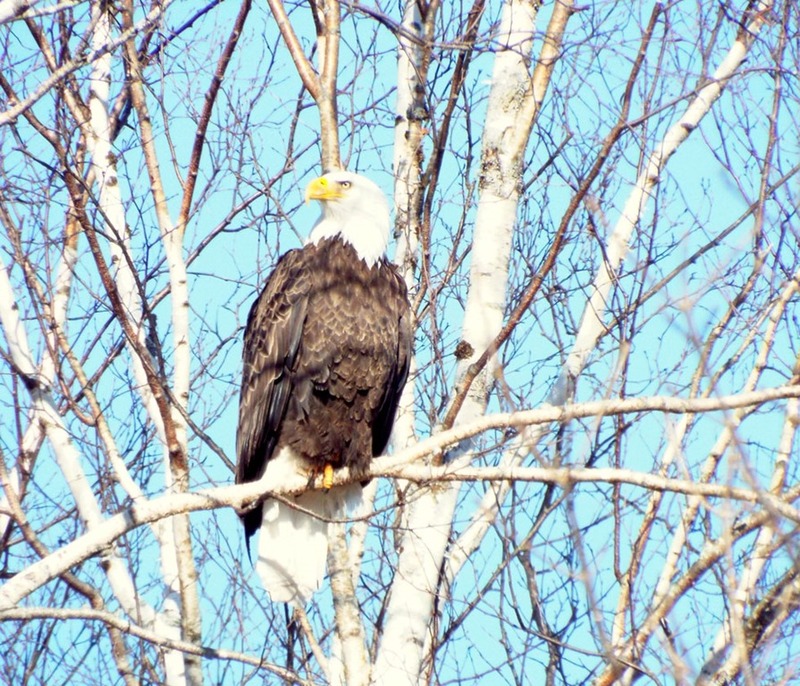 In addition we believe it would be beneficial that a River Watch Program be put into action. Provincial and Federal agencies and Conservation/Habitat Groups then would be working off the same page towards enhancing salmon habitat. We are in need of clear direction and technical support. We do not need poor Communication or no Communication at all. 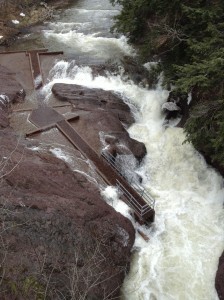 Our Fish Ladder at The Falls on the Waugh’s River is a good example of a bad situation. 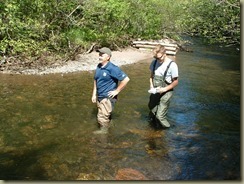 With our support and their budget DFO built a first class fish ladder for migratory fish in our watershed. Over 500,000 dollars was spent and the ladder works. Our fish counts above The Falls clearly indicate that salmon are now upstream as far as Earltown Lake and in every tributary of the Waugh’s River. We are grateful to everyone involved. But we now have a problem, DFO has walked away from the ladder and there is no maintenance program or budget in place to maintain the ladder. The Fish Ladder that allowed migratory fish to move upstream for the first time could now become an impediment to that migration. 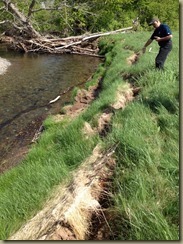 In our watershed this could be a Salmon Conservation disaster. We appreciate that not every watershed or local habitat conservation group has a fish ladder in jeopardy. The point is that every habitat conservation group is in need of good communication from our federal fisheries department. We believe that a total catch and release regulation of all salmon in all Atlantic Canadian rivers should be imposed. On the North Shore of Nova Scotia our group recommends that salmon fishing season should start at least two weeks later and extend into November. On the science front we need more information on the numbers on how many fish are being killed in the fall including The First Nation’s harvest. We need additional information on the impact of other fisheries such as silversides on salmon reconditioning in the spring . This is an issue on the North Shore of Nova Scotia. Mr. Chairman I must put on the record that whatever success we have had in the past has been a result of the excellent partnerships that we have with all levels of government. 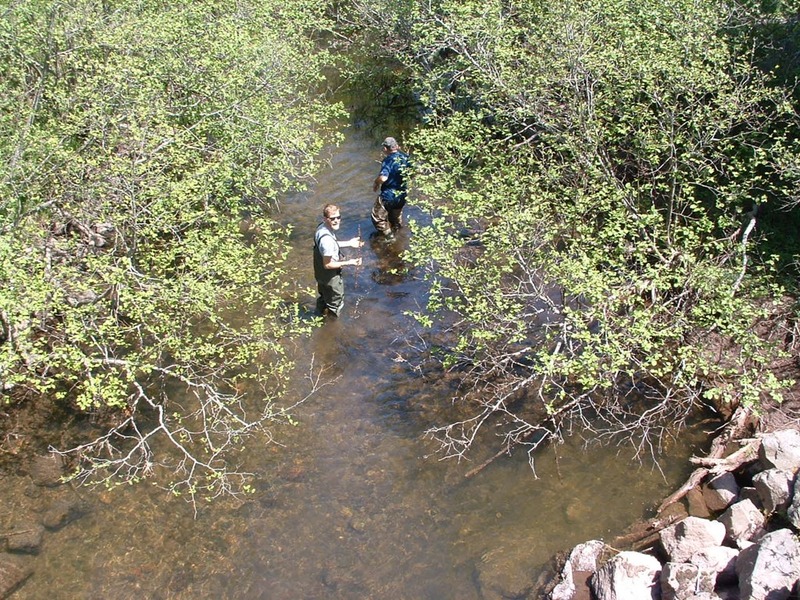 Without the Fraser’s Mills Fish Hatchery, a division of Nova Scotia Fisheries and Aquaculture Inland Fisheries, our ability to maintain our own salmon hatchery on the Waugh’s River would not be possible. 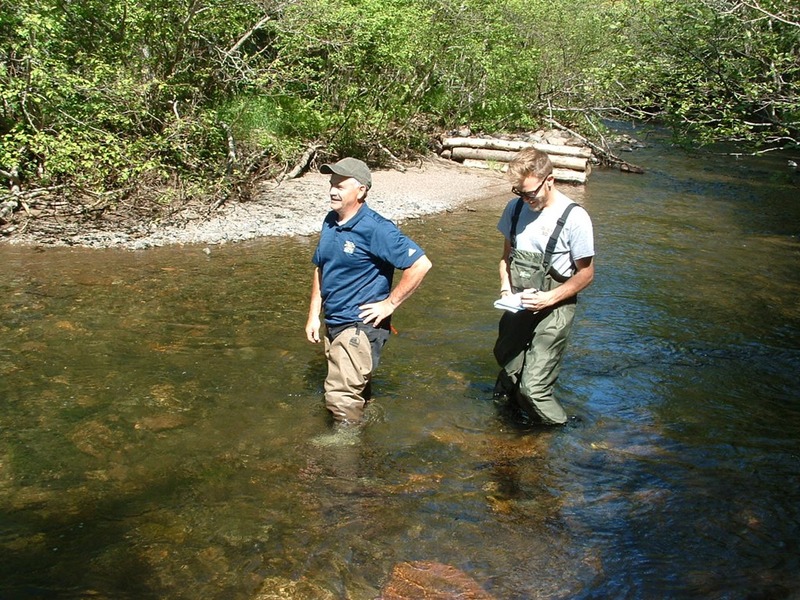 Together we have released tens of thousands of salmon parr into our watershed. NSLC Adopt a Stream of the Nova Scotia Salmon Association has been a major supporter of our program for many years. Their financial and technical support is the back bone of our program. The Municipality of the County of Colchester has financially supported our group from Day 1 because they believe our work is of major importance to the whole community. We are grateful. Our 2014 Annual Report is released today. Now Remember to Practice Catch & Release. This Fisherman never releases his fish so we have to show a good example! It was 3o degrees at The Falls at 4.45 yesterday as the first day of the 2014 Field Season was completed. What a day it was! Salmon Parr everywhere above The Falls. As we entered the Waugh’s River at each bridge between The Falls and Earltown it took only seconds to identify the results of this year’s successful migration upstream by salmon. In addition to that the growth of last year’s released Parr from our Brood stock Program was very positive. 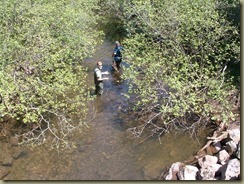 Charlie MacInnis and Adrian Martynkiw at Campbell Road Bridge and below at The Hatchery, Ferguson’s Brook. Earlier in the day we visited several sites on The Waugh’s River where proposed Bank Stabilization will be required to mitigate erosion problems. Charlie MacInnis inspects erosion site just upstream of The Falls. Adrian Martynkiw has joined us for the 2014 Summer work season. 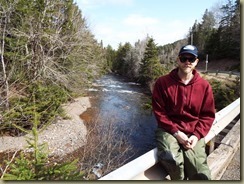 Adrian who recently moved to Nova Scotia from Western Canada brings several years of experience in working on rivers and in woods. We look forward to working with him. 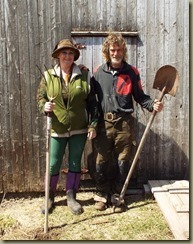 Next week he is off to Truro to take part in this year’s Adopt a Stream workshop. Gary Masters last year’s Crew Supervisor enjoyed working on the river so much he and his wife have bought an island on the Yukon River. They are moving there in June. 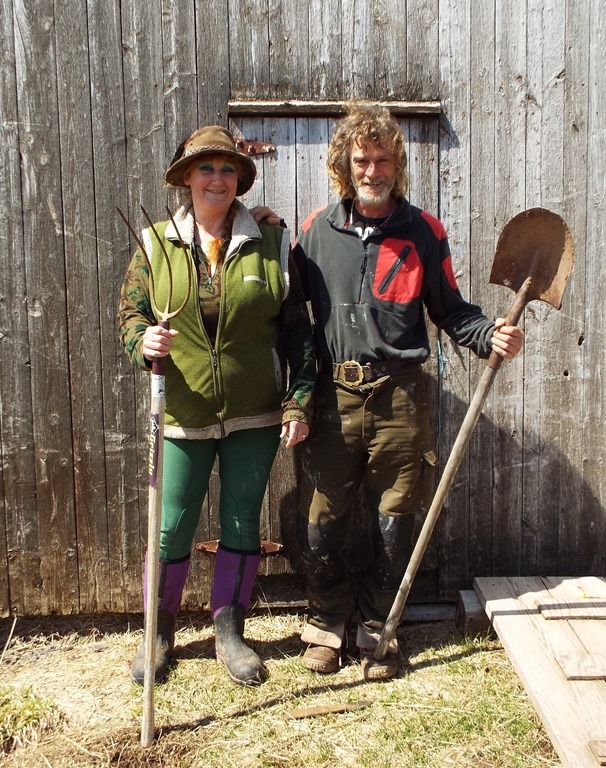 Good Luck to Gary and Lou as they venture north to the Yukon. 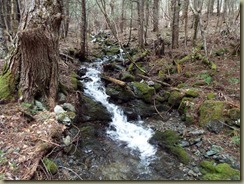 The sun finally came out and Saturday’s Walk on the Waugh’s River was a perfect day. The occasion was one of the events organized by our local branch of Slow Food in Canada to celebrate Slow Food on the North Shore. 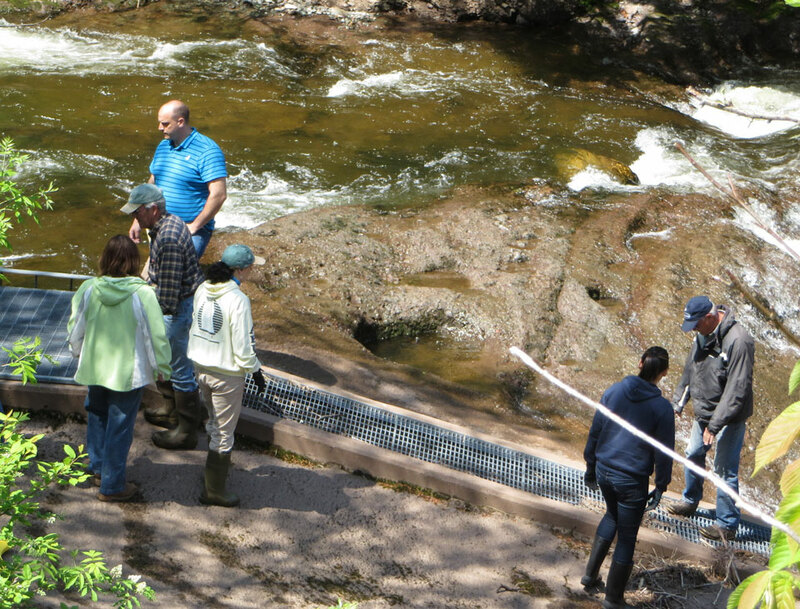 Members of the North Shore River Restoration Association provided a tour of the Fish Ladder at The Falls as well as a walk along the Waugh’s on Edmund Cameron’s property. The walking group saw first hand how our summer staff of students under the watchful eye of our volunteers enhance the fish habitat in our watershed for the benefit of migratory fish.